One of my measure of goodness of an experience is how much curiosity it excites, how many tangents I wander down because of it, what I learn as a result. By this metric, New Mexico has been HC. It started with a roadside historical maker. According to the marker, the Apache first acquired horses after the Pueblo Revolt of 1680. Until the moment I read the sign, I’d assumed that the conquistadors had ‘leaked’ horses starting about 5 minutes after they pitched up on shore. But if it wasn’t 1520-something, but 160 years later, my amazement at the brief blossoming of southwestern and plains horse culture increases. A way of life that left a mark across the planet lasted for something like 200 years. People got horses, mounted up, became consummate riders, made and adapted their culture and then… Crazy Horse and Wounded Knee and dead buffalo and the rez. I knew that there had been long-time trade between southern Mexico and the southwest, but holy carp, Scarlet Macaw feathers? And for all I know, given the macaw perches in Paquime, perhaps the birds themselves? 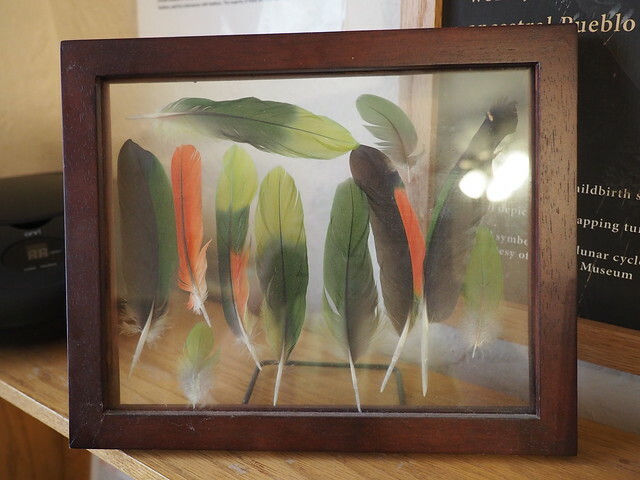 My first encounter with macaw feathers and trade routes was at the Mimbres Culture Heritage Site. 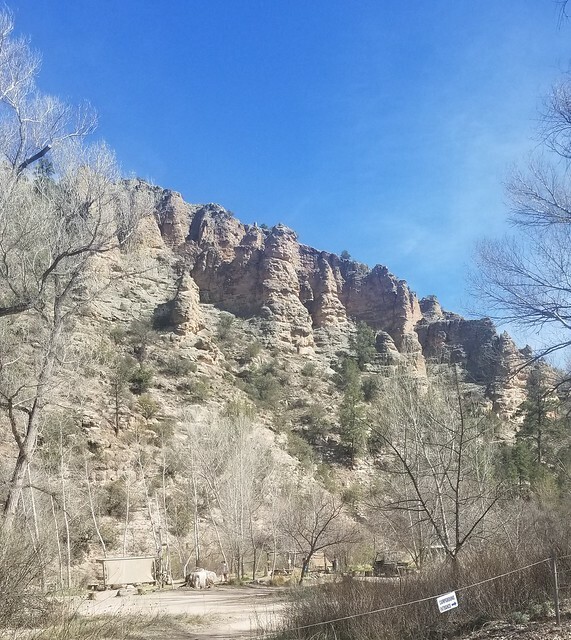 Macaws and parrots popped up again in a film at the Gila Cliff Dwellings National Monument; even today the Hopi people have a Parrot Clan. 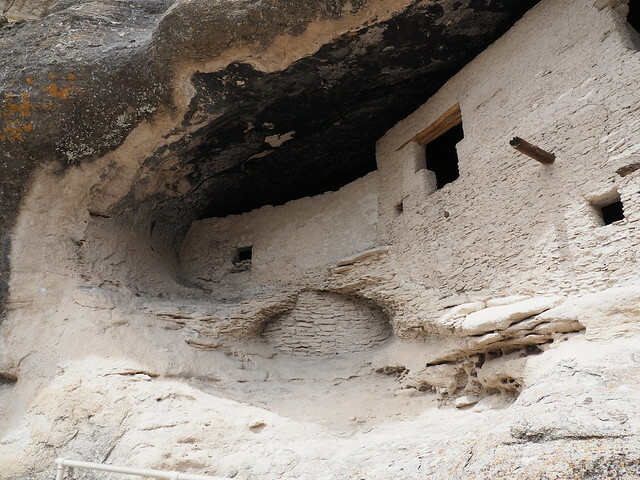 Another connection with something I’m interested in – some think that the Mogollon people migrated south when the drought of the 1200s made living in Gila cliff dwellings untenable. The genetic evidence suggests they ended up in Copper Canyon (where folks continue to live in cliff dwellings). Chatting with a ranger at the National Monument, I had a small inspiration: a ride from Chaco Canyon (northernmost trading center), through Paquime, to Copper Canyon. Maybe next fall? Regardless, I need to read more about the Pueblo revolt and ancient trade routes. The ride north from El Paso was lovely. 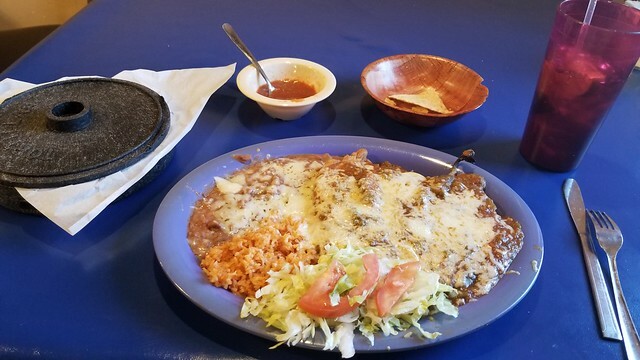 More pecan groves and cotton fields and lunch at Chope’s where I had perhaps the best chile rellenos I’ve ever eaten. I stayed at an RV park that had laundry facilities, so I was up early the next morning washing clothes. What with the late start that caused and a nice state park right up the road, it was a short ride to Radium Springs. 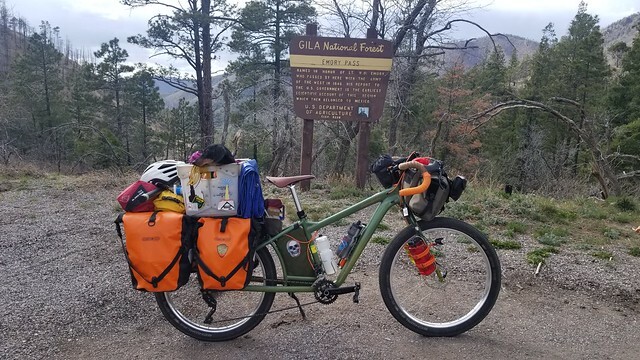 I splurged on a bundle of firewood and sat around a campfire with another bicyclist and a neighbor with a pop-up camper. Stars and bats and flames – a good evening. and started down the other side. Night falls quickly in canyons, so I pulled into the second? third? National Forest Campground we came upon. It was a cold night – below freezing when I woke up. I waited for the sun to creep down the canyon walls to the camp before I packed up, and we finished the descent from the pass. The ride from the bottom of the pass to Roberts Lake was gorgeous, through a broad flat valley full of birds and mule deer. And the National Forest campground had water! Yay! Monday’s ride was short but really tough. We rode up, over and into an ancient caldera. The climb was hard, but in some ways the descent was harder. I stopped a couple times on the way down to let my brakes cool – there just was no way i was going to let it all hang out with small Lotte as a passenger. But the effort paid off! We camped at Gila Hot Springs and I met Wallace, who is hiking the CDT, and Kevin, who’s finishing up a tour of New Mexico. Wallace had some great stories – I now know a lot more about cheap ferris wheels! And soaking in the springs was A++++. Tuesday was a short ride to the cliff dwellings, more soaking, and then in the evening, guying the tent in anticipation of big winds. The wind picked up as predicted – I woke up with sand all over the sleeping bag, tent floor, everything. I’d met a really nice family from Belfast, Maine the first night at the hot springs and they’d offered me a ride out of the caldera if I needed it. Folks, with the wind gusting 50kts plus and two steep climbs in front of me, I took them up on it. I am enjoying these posts — keep it up! Belfast, Maine? I wonder if it’s anyone my mom (who lives in Belfast) knows? And thanks for the continued wonderful posts and pictures! It took even longer than that, actually. The Cheyenne didn’t obtain horses until the 1740s. The Sioux a little after that. The Comanches, however, obtained theirs in the 1600s, at which time they were a branch of the Shoshone. The use of horses started an argument in the tribe about the topic, with those who wanted to adopt horses being termed “the Arguers”, i.e., the Comanche.